Year after year, content marketing continues to rise in popularity. Consumers are paying less attention to traditional advertising efforts and are now drawn to authenticity, transparency and value, paving the way for the creation and rise of content marketing. To succeed in today’s marketing space, companies need to recognize this shift and find new ways to reach their target audience that will provide value and grab their attention. Not only are companies competing against brands with similar products or services, they are competing for the consumer’s attention, loyalty, and money. To start, lets quickly break down what “content marketing” means: content marketing is the creation and distribution of valuable, consistent and relevant content on various platforms to attract a targeted audience while having an end goal of a profitable consumer action. Content comes in many forms including blog posts, videos, infographics, white papers, ebooks, podcasts and more. All these forms of content get distributed on various platforms and work together as engagement tools to form relationships and generate new ones. Content marketing may share the same goal as traditional advertising, but they are not the same thing. The key driving factor for content marketing is the exchanging of value – give your audience something of value so they will give you their business. But what do we mean by value? Value, in the case of content marketing, is providing the consumer with something that benefits their everyday life or interests. Whether it is tailored educational information, entertainment media, or response to consumer feedback, value can take on many forms. The key, however, is that the value is provided without requiring the consumer to make a purchase or take an action. It is given freely, with no expectation. Without adding value to your message, you are simply providing information on your product or service without giving your audience anything tailored to their own experience. All companies put out ads with an image, a tagline, and a few details, but that ad format is the norm. While this style of ad is important for brand awareness, it is not best for conversion. Our market is saturated with several product offerings for any given industry and using the exact same advertising method as your competitors will not set your company apart – it does not give the consumer a reason to choose you over your competitor. Content marketing caters to today’s consumers who have the desire to form relationships with the brands they do business with by interacting on an authentic level. Companies must adapt their marketing messages to specific characteristics of their audience and stop assuming one size fits all. Consumers in today’s market show a positive response to a more personal and tailored marketing message. Content marketing works as a tool to display your company’s authenticity; in fact, 70% of consumers feel closer to a company as a result of content marketing (Content Marketing Institute). Providing value first shows trust and transparency, giving the consumer a reason to choose your brand and remain loyal. Content marketing and SEO work together to better position your website in search results and to increase traffic to your site. Content, consistent updates, and linkbacks are all a part of a successful SEO strategy and can be achieved with content marketing. Content: SEO thrives on the content built on your website. Keywords, page headlines, and search phrases all contribute to site optimization. 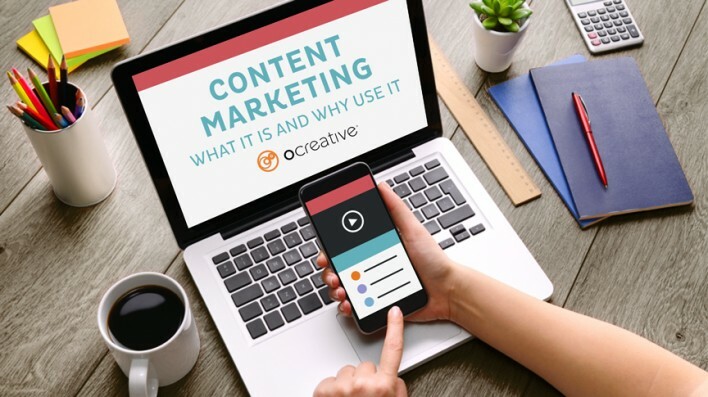 Content marketing allows you to consistently add to your website, creating more content for search engines to index, benefitting your SEO strategy. Consistent Updates: A successful SEO strategy includes the output of new content – Google recognizes that the majority of users want search results that are relevant and recent. Quality content marketing requires the consistent output of tailored content, that allows your site to meet the criteria of providing both recent and relevant information for users. Linkbacks: A crucial factor in boosting site optimization are the linkbacks that other digital platforms embed on their site linking their content to yours. With content marketing, you are consistently creating and distributing valuable content, thus giving more opportunities for your content to be shared on other platforms. Valuable content brings the consumer back after a purchase. Your brand becomes useful to them beyond your products or services. According to a Wunderman study, 79% of respondents said they only buy from brands they feel know and understand them. Customers can identify when a company is only trying to make a sale and would rather feel appreciated and heard than sold to as an anonymous buyer. By providing content that is helpful or contains topics in their interests, the consumer feels more valued and is more likely to trust that company. This trust results in the customer paying more attention to future marketing efforts and makes them more accepting of future offers. Content marketing allows you to reach new customers and generate leads because of the large variety of content you can create and the multiple ways you can distribute it. 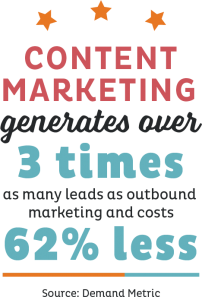 In fact, content marketing generates over three times as many leads as outbound marketing and costs 62% less (Demand Metric). 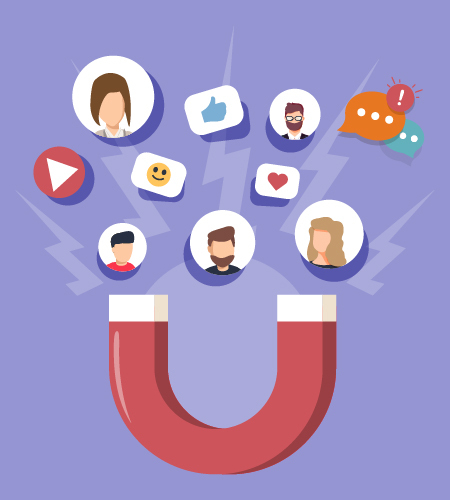 By consistently distributing content across a variety of channels, you can increase your brand’s exposure and reach consumers on multiple platforms. Think long-term when establishing a content marketing strategy. Its impact will most likely not happen overnight, however, content marketing is still a great investment because of its ability to impact your business for years to come. Unless removed from your website, the content created remains active on the web and continues to draw traffic. Do not get discouraged, stick to your plan, and continue to remain consistent on creating and distributing engaging content. The sooner you start making content marketing a part of your marketing strategy, the sooner you will start to see its benefits. The first step of content marketing, content creation, is arguably, the most difficult. Our article, “Top 5 Tips for Creating Better Content for Your Website”, can help you get started. If you are interested in creating a content strategy, but do not know where to start, contact us! We will create a content marketing strategy filled with engaging content to grow your brand on platforms that work for your company.